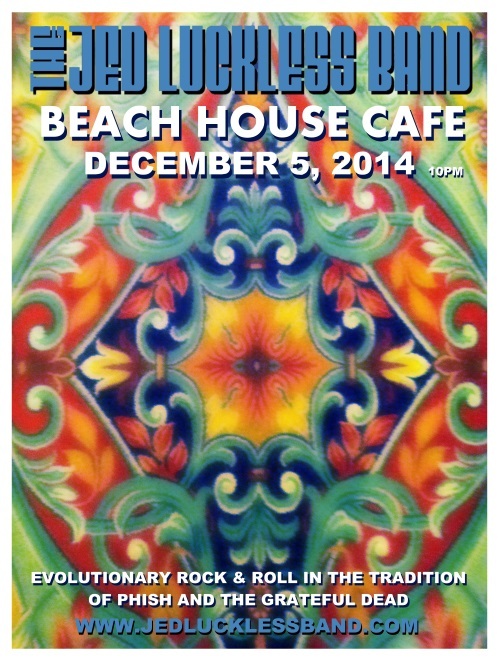 After a long hiatus, the Jed Luckless Band finally returns to the stage with a new JLB 2.0 lineup! The last show the band played was over a year and half ago so it’s great to have JLB back! And back they went to where it all began at Darkstar in Secondlife. Unfortunately, the bass player Kenny Kaufman could not make the show at the last minute, but as usual JLB trucked on in style, with veteran band member Mark Gutenplan playing bass, keys and guitar throughout the show. And of course with the introduction of Pete Martine on drums, the band’s newest member, already laying down great beats on the virtual kit. Despite missing a member and still working out the kinks of a new virtual venue, JLB 2.0 pulls off a fun show filled with classic originals, rockin’ cover tunes and a couple nice improv jams. The first set kicks off strongly with a jammy three tune run featuring “Victim Of The Rhythm,” “Englishtown” and the Beatles song “Dear Prudence.” The theatrical “Ozone Blues” is featured mid-set, followed by a cover of the Grateful Dead’s “Brown Eyed Women” which suffers from the lack of K-Man on vocals. The Jed instrumental “Valley Of The Saints” follows, but again msised something without the bass to drive it. The set wraps up with a JLB debut, the Phish song “Wolfman’s Brother,” which features a solid jam (although the studio levels peak out a bit on the recording). Second set opens with an “acoustic” portion featuring the Luckless original “Far Gone Blues,” Gutenplan’s “Remember This Night” and a Bob Dylan birthday tribute of “She Belongs To Me.” A favorite JLB Phish pairing comes next with “Sand” and “Dirt” with one of the night’s highlights, a drum solo from Pete, sandwiched in between. The evening concludes with a couple of classic JLB originals. It seems like every time The Jed Luckless Band visits the Beach House, they run into a rainstorm. But the band always brings their own sunshine and lights up the joint with high energy rock & roll! This time out is no different, and JLB delivers a tasty show to the die hard fans and friends who braved the storm to come. Set I opens with a particularly apt choice, the JLB original “The Freeze,” a tune written for December. Their original flag planted firm, the band quickly moves into a cover heavy set, launching into a hefty twelve minute Shakedown and including another three Grateful Dead tunes. Special guest “Edgemont Mike” joins on guitar for Ramble On Rose, as well as the JLB original “Englishtown” where he adds a nice Deady sound to the jam into “Rider.” A fun “Sneakin Sally” wraps up the first half. Set II is considerably shorter, and focuses entirely on JLB originals. A mellow version of the Gutenplan penned “Road Trip” starts the set off, followed by the Luckless tune “Sugar Pop” with a nice spacey jam portion. But the highlight of the set is the nearly twenty minute “Saw Mill River” and “Far Gone Blues” combination, which splits the Kenny Kaufman original in half, inserting the blues rocker and an amazing progressive type jam driven by Eric Stramiello on the drums. A slowed down version of “STILWU” wraps up the show. Another fun, rainy night in Greenwich, CT with the JLB and gang. Enjoy! The Jed Luckless Band returns to the Bayou, delivering a night of spicy jams and sizzling rock & roll to a crowd of old friends and new at one of their favorite venues. With the band warmed up, the first set starts to get jammy, with a nice version of the VU tune “Rock And Roll” paired with the Jed Luckless song “Still in Luv With U.” The set also features extended jams on the GRateful Dead’s “Eyes of the World” and Trey Anastasio’s “Sand,” also paired with Jed originals. This is a super fun show on JLB’s “home turf” with a nice mix of jams, covers and original music. Enjoy! The JLB returns to the Virtual Hotel Cheslea on a warm Tuesday night for a “spirited” show full of surprises and wild jams. After a short breath (the two set show turned into one long set due to technical delays), the band launches into another of their originals, the JLB classic “Victim Of The Rhythm,” busting out a thirteen minute version. The show wraps up with a short bit of “Dirt” paired abruptly with “SILWU” and the requisite “Playing Reprise” tacked on for good measure. A wild little show from the band that loves to keep on jammin. Enjoy! 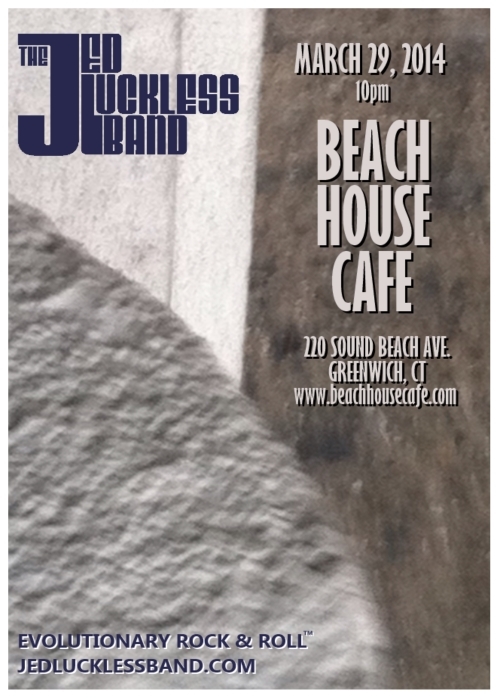 The Jed Luckless Band wraps up JLB March Madness with a return to the Beach House Cafe in Greenwich, CT! As usual it was a rainy night at on Sound Beach Avenue, but that didn’t keep the crowd from coming to party, and the band delivers, with a high energy show full of fun special guests. Filling in on bass is Al Buonanno, and he does a stellar job right off the bat with with the JLB original “Still In Luv With U.” The rest of Set I delivers a mix of Grateful Dead, Beatles and Bob Dylan, along with the classic “Dancing In THe Streets” to celebrate JLB’s three year anniversary, and the Beach House Cafe’s Tenth Anniversary. The set closes with special guest Charlie Lagond on saxophone, joining in for an awesome “Eyes Of THe World” and “Not Fade Away” combo. Second set features several Mark Gutenplan originals, including another sit-in by Charlie on “Englishtown,” paired with “I Know You Rider.” More classic rockers like “Mighty Quinn” and “After Midnight” round out the set, with Mickey Glauber and a variety of other vocalists joining in the fun. JLB is back at The Bayou, as part of their 2014 March Madness tour, delivering a solid show on a rainy night with half the band feeling under the weather. The show starts off Kenny strong, with the local favorite “Saw Mill River,” and revs up quickly on the jam front with an extended version of the Trey Anastasio tune “Alaska.” The first set features a couple Dead tunes, the peppy JLB original “Sugar Pop” and a jammy band favorite, “Sand” to take things to set break. With K-Man’s condition worsening, the band manages to put together a hot, but short second set, opening with with a strong version of the band’s tune “Victim of the Rhythm,” followed by a nearly thrity minute stretch of rock covers, including the Dead’s “Fire On The Mountain.” The heat must’ve been too much for the bass player, since Ken unfortunately bows out before the last tune of the night. But in true JLB style, the boys carry on, with Mark picking up the bass and closing out the night with “Dear Mr. Fantasy.” A fun show with a vibe all its own. Enjoy! After a long, long time on the virtual road, The Jed Luckless Band finally returns to their Secondlife home stadium, August West Amphitheater on Darkstar. The band delivers a fast paced, energetic show, with a mix of originals, covers and psychedlic jams, driven on by an amazing partcile light show in-world by Particle Tom. Second set keeps the Phish heads bouncing, with highlights including a sweet Ocelot and Oce-jam opener and a spooky “Ghost” with jam. Grateful Dead fans are not forgotten with a smokin’ version of “Jack Straw” and a rockin’ “Deal” closer. Enjoy!